Full Membership of the Conservative Party is £25 per person a year (£5 if you're under 23). Current or former members of the Armed Forces can join for a reduced rate of £15. Full Membership entitles you to take part in all decisions taken by the Party at national, regional and local level. These include the postal ballot for the election of the Leader of the Conservative Party. The selection of Parliamentary, European, Lincolnshire County Council and East Lindsey District Council candidates. The election of the Louth & Horncastle Conservative Association Management Team at the AGM. 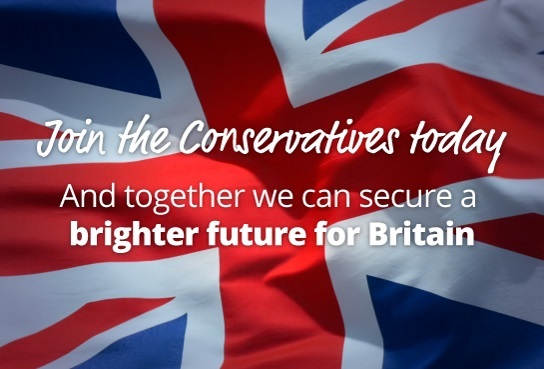 The right to apply to be nominated as an official Conservative candidate. The right to be nominated to the LHCA Management Team. The right to be nominated to the LHCA Executive Committee. The ability to attend the Annual Conservative Party Conference. Access to exclusive, member only events. The Louth and Horncastle Conservative Association is made up from like-minded people whose aim is to build a better constituency by promoting Conservative values. The Louth and Horncastle Conservative Association is open to anybody who supports the Conservative cause. The Association is one of over 600 Conservative Associations which are part of the national Conservative Party. The Louth and Horncastle Conservative Association works within the constitution of the Conservative Party but – as with all local associations – it is run and paid for by local people. The Louth and Horncastle Conservative Association is run by an Executive Council which includes representatives from the Louth and Horncastle wards, East Lindsey District Council wards and Lincolnshire County Council divisions which make up the Louth and Horncastle constituency. These may include Conservative councillors who represent Louth and Horncastle wards together with other representatives nominated by local ward Conservative branches. The Chairman, Deputy Chairman Membership, Deputy Chairman Political, Treasurer and up to three other officers of the Association are elected to the Management Team at the Annual General Meeting which is held in March of each year. All paid up members are entitled to attend the AGM and vote. The officers are responsible for the day to day running of the Association and report directly to the Executive Council, which meets quarterly. The Executive Council, with the advice from the officers, decides the Association’s policy. The money we raise locally enables us to run the office in Eastgate Louth which includes the costs of rent, utilities, stationary, IT and printing, and also to fund literature and produce election leaflets. Many of our fundraising events are organised at ward level by our Conservative branches. These, like our Association events, are both social and political. All members are invited to attend. All of our members pay a subscription as they want to support the Conservative Party financially, however, we always want members (old and new) to get more involved in helping. As you will see from our events and news pages there are plenty of ways to get involved and enjoy your membership! LHCA currently has 5 active branches: Louth, Coastal, Woodhall Spa, Coningsby & Tattershall, Conservative Policy Forum and Conservative Future, but we are always looking to open more. The number of meetings held annually varies. Some meet monthly, others less frequently. They always welcome new members and supporters who want to get involved. Please contact the Association for details of your local ward brand who will be delighted to hear from you. Members are also encouraged to help with running the Association. Dont just back us, join us.